Both of these pies are delicious, but they are very different; the medieval pie is sweet, the modern is savory. The sweetness of the medieval pie comes from added fruit and honey. As the pie bakes, the fruit melts, giving a lovely counter-taste to the tart vinegar and salty bacon. The fruit flavor fades into the background and what remains is a sweet, rich meat pie with an easy medley of flavors. The savory modern pie was more what we imagined when we read about beef-and-bacon pies of Winterfell. For all that this is a relatively dense dish, the flavors are fairly light. The beef, bacon, onions, and herbs are all distinguishable, but don’t linger overlong on the palate. Bottom line? Medieval is sweet, modern is savory. Make both, and tell us what you think! *The Modern recipe is now exclusively in the GoT Cookbook. Our changes: We added bacon. Delicious, thick cut bacon, in place of the marrow. We winged the proportions a little on the dried fruit based on what was left in our pantry. On the stovetop, cook the diced bacon until the fat runs from it; drain off the fat. To the bacon pan, add the beef, spices, vinegar & the fruit. Add enough broth to thoroughly wet the mixture – the final consistency should be runny. Throw in the flour and cook on low heat until the juices form a sort of gravy. Let cool. Line a 9-inch pie pan with and fill with the meat mixture. Add a pastry lid or leave open-faced. Bake at 375º F until filling is bubbling and the pastry cooked, approx. 40 minutes. NB: The cookbook contains a better, more delicious, perfected modern pie recipe, complete with a lattice-woven bacon top. « Rock Your Premiere Party! I’m thinking that I will make the modern recipe – with a twist – for tomorrow’s premiere. Throw in a few more root vegetables – carrots and parsnips, I think – and then use that base for a shepard’s pie. Maybe a little wholegrain mustard in the mashed potatoes as well, for good measure. That sounds delicious! We’ll look forward to hearing how it turns out! What e-mail address should I send the pics to? I think I need to try this recipe. I wish it wasn’t Good Friday or I’d go to the grocery store right now! I posted the recipes to my family and they said they both like both pies. So in the next few weeks, I’m going to make one and then the other. i will send photos of the finished product. A perfect menu for the stew meat packages we got when we bought a grass-fed, pasture raised steer last fall. Both versions look very tasty. I’m wondering if this wouldn’t be a good thing to turn into a sort of Cornish pasty? If the filling is thick enough, these would make great individual hand-pies. That sounds like it would be delicious! If you could cook the mixture down such that it thickens up, it would probably work brilliantly. If you attempt it, please let us know how they turn out! My mom made a hand pie like a pasty that had a base of smash (that is, potatoes and rutebaga mashed together), and with ground pork, kale, onion and seasoned with cloves. It was somewhat like the French Canadian tourtière. She said that it was a very old recipe. The modern meat pie turned out great, but I thought it could benefit from a bit less bacon; it seemed a bit overpowered by it. I used a large muffin pan to make several small pies and they turned out nicely. Thank you for posting this recipe! I’ve been wanting to make this for good long time now. They sound delicious! Congrats on a successful fudging of the recipe based on what you had in the pantry. The cheddar cheese sounds like a great addition, and I’m sure Martin would agree! we kind of have these in Australia, and they taste great. Soooooo good! I’ll confess that for this (and the other pies here I’ve tried) I used Pillsbury refrigerated pie crust, and put it in a deep 9″ plate. That, plus being hungry and impatient – which led us to fill the crust and stick it all in the oven precipitously – led to a shorter cooking time for us (~ 25 min). Also, I’m a bit nutso about wanting precise measurements (I like to duplicate tasty results! ), so this may be excessively-detailed, but I want to share. In our cupboard, we have a delicious homemade rub we use for various beef roasts, which is made up of 1/2 c kosher salt + 1/4 c dried rosemary + 1/4 c horseradish powder + 1/4 c garlic powder + 1/8 c black pepper. We used 1/2 tsp of this rub, plus 1/4 tsp each of rosemary, sage, and table salt; plus a bunch of grinds of fresh black pepper (probably 1/8 tsp total). Amazing. Every time we make one of your recipes I swear it’s the best yet, and it was true again this week. It will be a crime against food if someone doesn’t give you a book deal. My husband got some oxtail at the farmer’s market when he was picking up the beef for this pie, so we’ll be making your soup early this week. I’m completely torn over what to make for dinner next Sunday. YUM! We will look forward to hearing how your oxtail soup turns out! I love your website. Historical food is something near and dear to my heart and I love to see modern people experimenting with medieval flavors. One thing I’d suggest is trying the medieval version with the proper crust – what they referred to as ‘take a paste and make it into a coffin’, or in a nutshell, the hot water crust. This is thicker, not crumbly, excellent for carrying as a handpie, but still good to eat unless you make a very large version (because that has to cook long enough to turn into cement in order to hold the contents safely.) 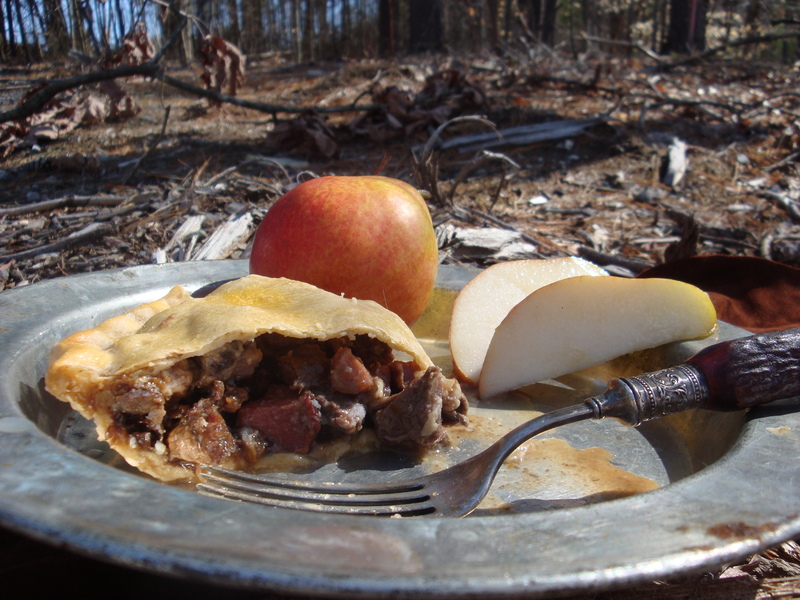 You’ll find a lot of the medieval ideas of ‘pyes’ or chewetts are drier than what we prefer for meat pies today, but they really are a different animal when done from start to finish according to medieval tastes and that’s interesting to experience for its own sake. We have a coffyn recipe with a hot crust in the queue, watch this space! A couple months back, I made both of these simultaneously, so the other half and I could compare and taste test right then and there. I loved both of them but preferred savoury (modern), and he loved both of them but preferred sweet (medieval). The demonspawn were gone, so they didn’t get a say, and the food was so good, we didn’t even share leftovers with their unappreciative souls when they returned! Once the weather turns cooler again and something this hearty sounds good, I’ll break down and make each for them. Great, Great, Great recipes! I made this for our GoT potluck and absolutely loved it! I made the modern recipe because I’m not a fan of fruit with meat. I used pate brisee for the crust, and it was just delicious. Thanks – and thanks for the incredibly cool site. I made the modern version tonight, and it was absolutely delicious! I changed a few things, like replacing half of the onion with celery stalk, adding some mushrooms (both for my daughter’s sake, to get some more veggies in the dish :D), and I added a splash of sherry cooking wine when I was preparing the meat, and some fresh grated horseradish. Your instructions were spot on, and I must say that taking the time to cut the meat in pieces, instead of using ground meat, is a winner. I have been wanting to make a meat pie since forever, but your version was the first convincing me it’s worth trying. I could barely keep myself from serving me a second helping, and my daughter ate it like nothing and said she loved it and that it was “full of taste”! Should I say it is the first time I convince her to eat any type of pie?! :))) Thank you so much for another great recipe! That sounds awesome. Was it this Gordon Ramsay recipe? I made a lot a few beef mini pies according to the medieval recipe and they turned out AMAZING. I left out the dates but the raisins and prunes were a nice treat. Next time though, I’ll add a little more gravy. The pigeon pie is currently cooking in the oven although I used leftover chicken instead and left out the turnip as we had none. I tried the modern version of this, and it was delicious!! I decided to add some chopped carrots and sage, and used a store-bought pastry rather than making my own. It turned out great, even as a leftover. I will definitely be making this again in the near future. Thanks! I was wondering, as the medieval is a sweet pie would it be suitable for a dessert? i really want to make this as part of a 3 course meal but i’m not sure where to serve it! I know what I’m eating tonight! better get grocery shopping, I need to make me some spiced wine and beef and bacon pies! This recipe looks amazing!! I’m making both pies since I’m having friends over and I wanna feed everybody. I live in the US though, and if you could let me know what type of bacon is best to use, that would be amazing! Hey there! We, too, are US based, and suggest you use standard cut breakfast bacon. Our favorite variety thereof is black forest. Another alternative that can save you a few bucks is if you have access to bacon ends. Blood Farm in W. Groton, MA has some amazing bacon, and they sell the ends relatively inexpensively. Perfect for a recipe like this! I’m definitely going to try out the one that’s got me intrigued: the sweeter medieval one. I love a good balance of sweet, sour, savory, salty, and this version sounds ideal, just like the honeyed chicken (which I also have to try soon). What a great blog! The modern version is sooooo good. Come October, I think I’m adapting the filling into a beef and bacon stew. I used the modern recipe, added carrots, peas and potatoes. It was yummy! But I used some pie crusts I had in the freezer and puff pastry because I still had some filling in the pot. In the end I had to freeze one pie, and one month later, I defrosted it, and it was even better. Made the modern pies tonight. Used fresh rosemary from my garden. Also, added potato which I shredded with my food processor, and therefore didn’t need to add any flour to thicken the gravy. I fired the bacon beforehand, and drained 3/4 of the fat, then cooked the beef, potato, and onion in the remainder of the bacon juice. I seasoned with garlic, salt, pepper, and rosemary. Very savory, delicious. The modern recipe is delicious! This was just amazing! I made a hybrid of the two recipes; adding dates, omitting the other fruit and vinegar. I also chose to use coarse ground sirloin, as I feel that might better represent the type of minced they had in mind. Finally, I upped the bacon to about a cup. The end result was a savory dish with just a subtle hint of sweetness to balance out the bacon. I believe I shall have to get the cookbook. I just bought the Feast of Ice and Fire cookbook and tried some recipes with friends. Our main course was the medieval beef and bacon pie and it was delicious ! The mix of the beef, bacon, wine vinegar and fruits was perfect. Thank you for your work! I made the medieval version last night. I did end up with a few substitutions due to what I had on hand. I was a little short on beef so there was also a breast of chicken in there and I didn’t have any dates, so I used dried apricots. It turned out really good. Well my husband and I liked it, our son didn’t like it and our daughter refused to even try it. I guess at 19 years old I can’t tell her she has to “at least try it with an open mind” anymore. I have tried a mix of the two pies, using ground beef and dried cranberries, raisins and dried apricots (but without the carrots), added with the onions at the beginning of the recipe. It was really delicious, the fruits are soft and sweet, the meat almost creamy with the gravy… The pie did not last long ! Thank you for all those recipes, I’m French but I’ve bought the book in English (since there is no translation in french), and I can’t stop reading and re-reading it and trying the recipes and transforming my usual meals into something a bit more… “martinish” ?! We had the modern version this weekend, served with Roman carrots, and it was delicious (I stuck with a pastry lid and put the bacon in with the beef, as I didn’t trust myself to weave a good bacon lattice!) It is also really tasty on the second day, and we’ll be finishing it tonight with the medieval beets recipe from the book. Looking forward to trying the medieval recipe now – we both love meat dishes with fruit in them, so this should be a treat. So, my awesome husband bought me the cookbook as an early anniversary gift and for our anniversary last night I made the medieval version with the medieval turnips in butter, nice glass of red wine beside…I was nervous as I don’t like all the ingredients but the round the table response from my husband and I was …wholly awesome!!! We were both blown away by the favors and textures, officially a family favorite. (And yes, I used the book pastry recipe as well). We cannot wait to try another dish. Oh my god, this is absolutely delicious. I made the medievals and now I cant say anymore that I don’t like the bittersweet food. We made a lovely premiere dinner thanks to you girls and your amazing work. I made the beef n bacon pie whit the Stuffed green peppers to start and then we ate the Rabbit and beer stew, with some Black beer bread. It was an excelent food for the so waited premiere. Thank you for this amazing blog! I have really been enjoying making both versions of other recipies – but when I get here I see the header has both, the notes refer to both, but there is only the medieval recipe. Can you reporst the modern recipe? thanks ! The modern recipe that was on the blog was an early version of the dish. A better, winning modern recipe went into the cookbook, so unfortunately, I can’t post that here, due to rights issues. I’ve had the book purchased for awhile (as in, pre ordered it) and just now made the Medieval beef and bacon pie. I was a skeptic initially because of the prunes in addition to the bacon… And moreso thought I would dislike it once I added the vinegar and smelled. However, once it’s baked the flavors meld so nicely. I did use a double crust recipe from the Feast cookbook and I believe that’s a necessity to the recipe – crust in a can will not give the same buttery taste and flaky texture that balances this dish so well. The sweet fruits nearly melted with the exception of the raisins during baking time, and the bacon held its color so it looked nicely once it was cut. Overall, the verdict was incredible. My boyfriend is claiming that it’s “insanely, stupidly good.” Anyone that is a skeptic because of the odd ingredients – try it out. It really is the best meat pie I’ve had. Hi! Thanks for posting some of your recipes online for us — can’t wait to try them, and I definitely plan on purchasing the book. The filling for the medieval pie is very similar to a Cuban picadillo that my family makes (keeping in mind that every Cuban family has a version of their own, and it’s best to hold one’s tongue about who has the best recipe, lest there be lifelong feuds and daggers in the dark…), except we soak our raisins in a mix of cream sherry and brown sugar until they’re bloated with sugar and booze. That might be worth trying with the medieval recipe — I mean, why mess around? Drown those prunes! if you were to use marrow though, how much would you put in? Still 1/2 cup? Wanted to thank whomever mentioned the thyme! I made this basically as written, but it was missing something and the thyme totally rounded out the flavor. Thanks for posting this! I have had the cookbook for a few months now, though I am just now getting around to trying some of the recipes. I made the medieval recipe yesterday, with some changes. Before I started, I cooked the beef overnight in a crock-pot with salt, pepper, and Sam Adams White Christmas, then shredded the beef before adding it to the rest of the filling. As a bonus it also makes a great broth. I also added a few juniper berries to the filling. The shape of all these pies should not be in a modern pie pan. The Cornish Pastie (still popular in northern Michigan) is a perfect example of the medieval pie. All meat pies should folded over pieces of dough, then sealed and twisted closed. The pies were usually picked up and eaten out of hand….the way we would eat a hamburger. Am I missing something? I only see one pie recipe here… Is this the medieval or the modern? Some of the original recipes had to be pulled off the site because they went into the cookbook. The BnB pie recipe here is the Medieval one. I made both. Dont like the sweet version so i tweeked the savory by switching the dried fruits for root veggies parsnip and turnips. Was really great with the bacon in it!! I slightly clarified my butter before makibg my pie crusts. Used a muffin tin to make portioned sizes great for taking for work lunches. Now my office wants me to bring them for the christmas party.